Our cooked mussel meat is made of the Chilean mussel. This type of mussel is also known as the Chilean blue mussel, the Mytilus edulis platensis or by its Latin name, which is Mytilus chilensis. Our cooked mussel meat is native to the coasts of Chile and the Falkland Island, which is also known as FAO fishing area 87. However, ever since the sixties the Chilean mussel is under intensive aquaculture in Chile. In this country they hang the mussels on lines and they harvest them throughout the year. When the mussels are harvested they are cooked so that their shells will fall off. Afterwards there is only cooked mussel meat left, which is imported to our company in the Netherlands. However, we can ensure you that our imported cooked mussel meat is processed, packaged and transported in perfectly hygienic conditions since we know our suppliers personally. As a supplier we sell our cooked mussel meat without its shell and cooked. We also have crispy mussels available at our ‘Added Value’-page. Cooked mussel meat has a sweet and delicate flavour. In fact, it is more tender compared to mussels which are not farmed. Cooked mussel meat is also very nutritious. For example, it is rich in protein and B vitamins. Thereby it does not contain much calories, since one hundred grams of cooked mussel meat only contains around 95 calories. Cooked mussel meat is low in fat too and it does not contain any carbohydrates. However, they will when you bread them of course. Cooked mussel meat is eaten in a lot of countries. However, it is the most popular in the Mediterranean cuisine. This is one of the reasons why we mainly export our cooked mussel meat to Italy and Spain. 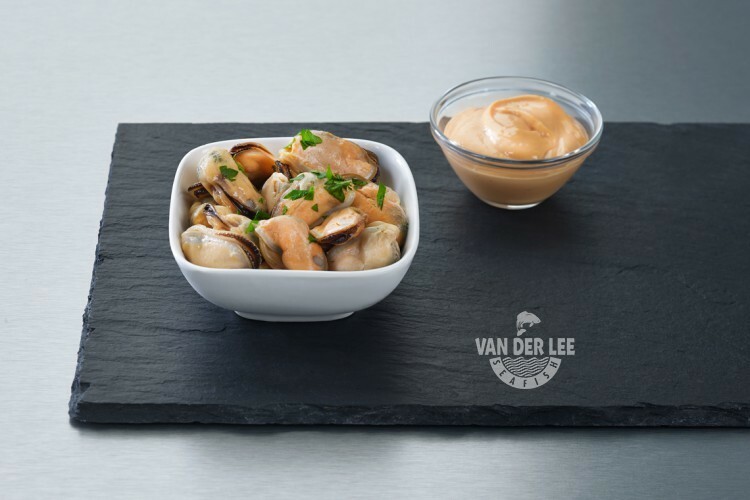 However, some of our cooked mussel meat is sold in the Netherlands and some is exported to the United Kingdom. There are different ways to prepare cooked mussel meat. Some people like to eat it in a paella with shrimps. Mussels are also often used to make a risotto or salad. You can also eat the cooked mussel meat as tapas. One well-known tapas dish which includes cooked mussels is called ‘Mejillones a la Marinera’. This is a delicious dish in which the mussels are prepared in seaman’s style.